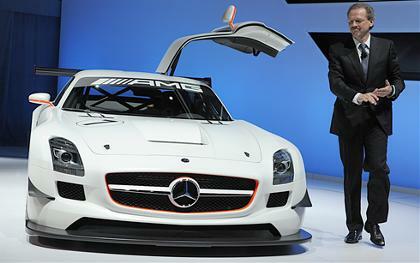 Mercedes-Benz is showing off its new SLS AMG GT3. Basically, they took the hottest car and made it hotter for the racetrack. It's the racing version of the SLS AMG, and it should start showing up on the circuits next year. The GT3 race car has a new front skirt with enlarged air intakes. The hood features a central opening for the extraction of heat from the engine and there are side openings in the front fenders. The side and rear windows are made of polycarbonate instead of glass to reduce weight. The windshield might even get the same treatment. There's a carbon fiber spoiler on the rear.